Public outcry continued to grow Thursday, with more university students, professors and civic groups denouncing President Park Geun-hye over the scandal involving her close confidante. While the embattled president has remained silent since her two-minute apology Tuesday, calls are growing for Park to take responsibility for the state crisis, with some even demanding her to step down. Students from a total of 15 universities across the country criticized Park for “destroying democracy and shaking the nation’s foundation,” by allowing Choi Soon-sill to use their relationship to interfere in state affairs. The president is “downplaying suspicions” and “showing no remorse despite her violation of the Constitution,” students of Korea Advanced Institute of Science & Technology said in a statement. Earlier on Wednesday, students from Ewha Womans University, whose top management is suspected of giving special favors to Choi’s daughter Jeong Yoo-ra in the admission process, called for a thorough investigation. 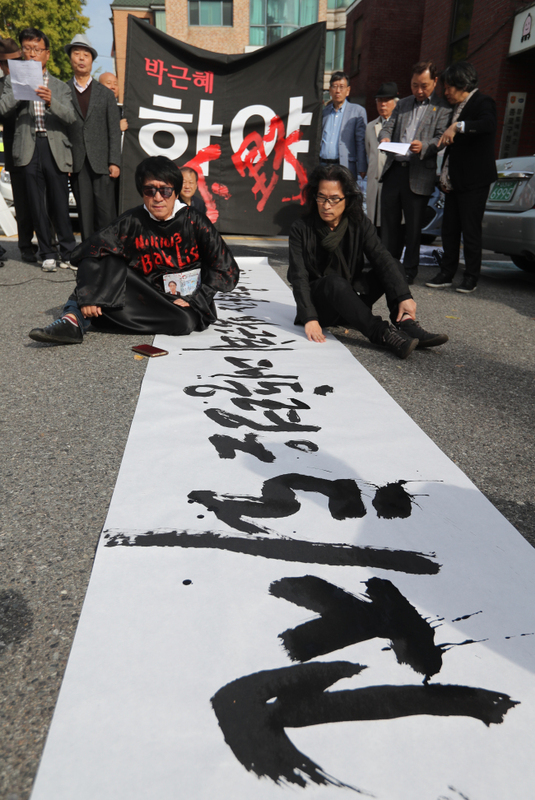 Students from Sogang University, Park’s alma mater, also demanded the president stop tarnishing the name of the school. More statements slamming the president and her confidante are set to follow, with several student bodies at major universities including Seoul National University and Korea University collecting opinions from students. Marking the first public condemnation of President Park by professors, a total of 32 professors from Sungkyunkwan University issued a statement Thursday morning. They urged the president to form a comprehensive, neutral Cabinet which can take charge of state affairs from now on. A group of professors from Kyungbuk National University said in a statement that the president led the country into chaos due to her incompetence, irresponsibility, unfairness and involvement in corruption. Several civic groups have held, and will continue to hold, candlelight vigils and rallies across the country, demanding President Park resign. Lawyers groups, such as Seoul Bar Association and Lawyers for a Democratic Society, also called for an extensive probe into the case and punishment in accordance with the result. Two university students held a surprise rally at a convention center in Busan -- near where President Park attended a forum -- chanting “Park Geun-hye, step down. Arrest Choi Soon-sil.” They were caught and brought in for questioning on charges of violating the public assembly act. Some 200,000 people are expected to take to the streets calling for Park’s resignation in a large-scale rally held by labor unions, student groups and civic organizations along the Cheonggye stream near Gwanghwamun Square in central Seoul from 6 p.m. on Saturday. Despite President Park’s rare apology in a televised address Tuesday over the leak of confidential information to Choi, the public’s anger appears to be far from eased. Choi is suspected of using her ties with the president to raise donations from conglomerates, embezzling donations for personal gain and having access to classified information about the president’s speeches and state polices.